noun a painting of Jesus Christ or another holy figure, typically in a traditional style on wood, venerated and used as an aid to devotion in the Byzantine and other Eastern Churches. • a person or thing regarded as a representative symbol of something: this iron-jawed icon of American manhood. • Computing a symbol or graphic representation on a video display terminal of a program, option, or window, esp. one of several forselection. • Linguistics a sign whose form directly reflects the thing it signifies, for example, the word snarl pronounced in a snarling way. ORIGIN mid 16th cent. (in the sense [simile] ): via Latin from Greekeikōn ‘likeness, image.’ Current senses date from the mid 19th cent. onward. We have Sport’s Icon’s, Musical Icon’s, Artistic Icon’s, Computer icon’s, in fact I am pretty sure we have icon’s for nearly everything around us, one way or another. It’s easy to look past the icon’s of a city which have icon’s all their own. These are things that have come to shape a city, it’s feel, it’s character, it’s ambiance, these icon’s make a good city, GREAT. 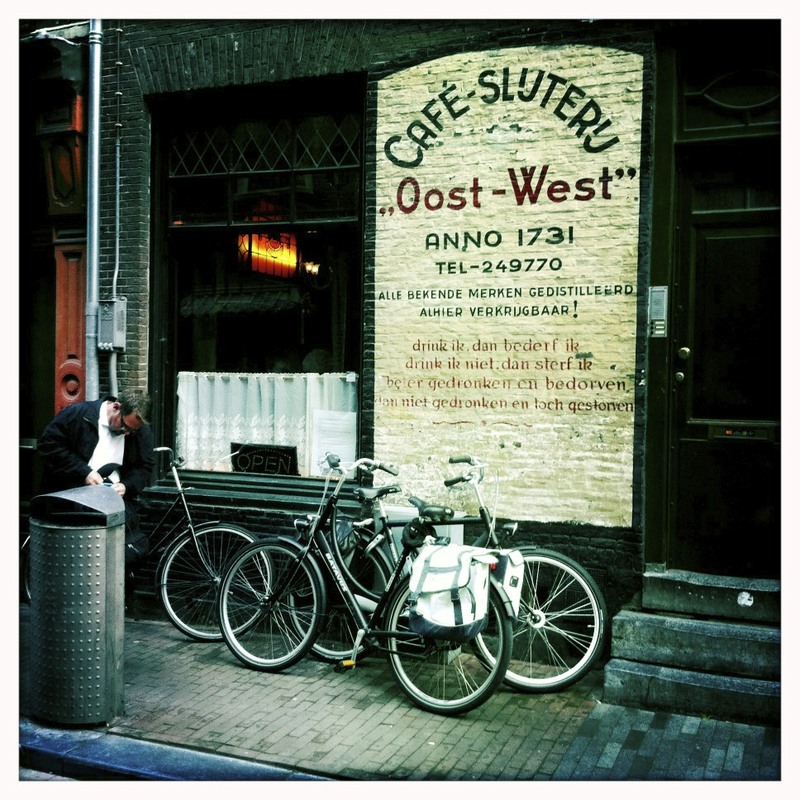 On a recent visit to Amsterdam I couldn’t help but find beauty in some of this Cities icon’s. With their delightful views, pretty bridges (well over 1200 of them), Gabled Houses, and relaxed waterside cafes. Amsterdam’s canals (about 50 miles of them) are great to explore or simply sail through them enjoying the view of the city. They are a constant reminder that the Netherlands is the worlds flattest country, half of which has been reclaimed from the sea with the aid of dykes, canals and more recently huge tidal barriers. 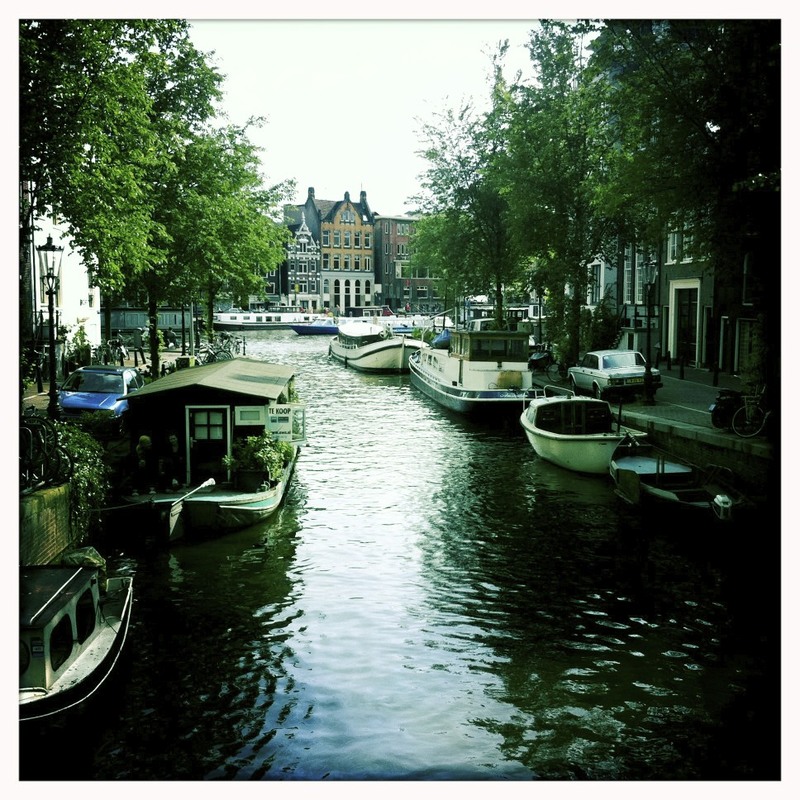 The canals of Amsterdam have been part of the city’s landscape since the early 14th century. 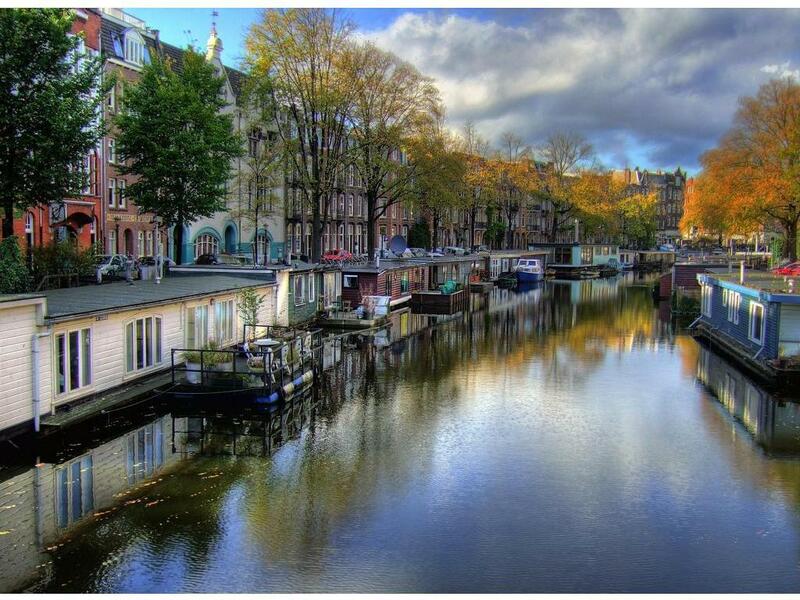 The Canals of today were built during the 17th century, which was considered Amsterdam’s Golden Age. At that time, officials of the thriving city decided to build a series of three concentric semi-circular canals around the old city center. 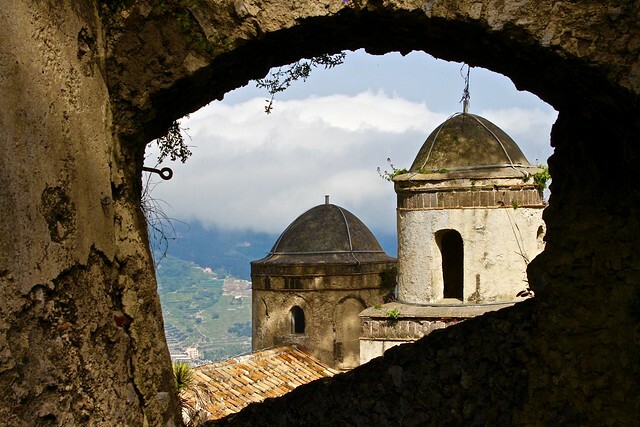 As time passed, hundreds of narrow streets and smaller canals fanned out from the center, crossing the semicircles and creating 90 islands and 1,280 bridges, all within the city limits. The canals ended in squares on the outskirts of the city, which were often used as parking spaces because, for years, vehicles were not permitted in the city. Canals are sealed from the North Sea via locks, purportedly a Dutch invention of the 14th century. The Canals and the bridges that cross them are absolutely beautiful and breathtaking, if you decide to snap a picture or two, you won’t be alone. 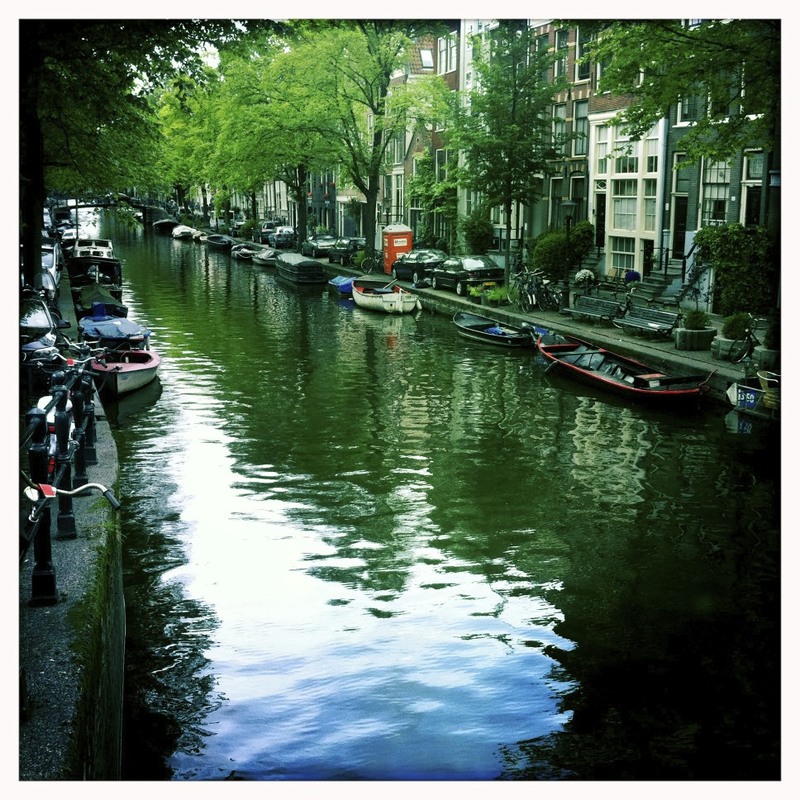 However the canals are much more than just a pretty picture waiting to be taken. Canals are an easy way to get around the city. In fact a municipal Canal-Bus system travels three different routes throughout the city, this allows the locals to get almost anywhere in the city with out walking, driving or cycling. And it is the best way for tourists to get from one attraction to another. 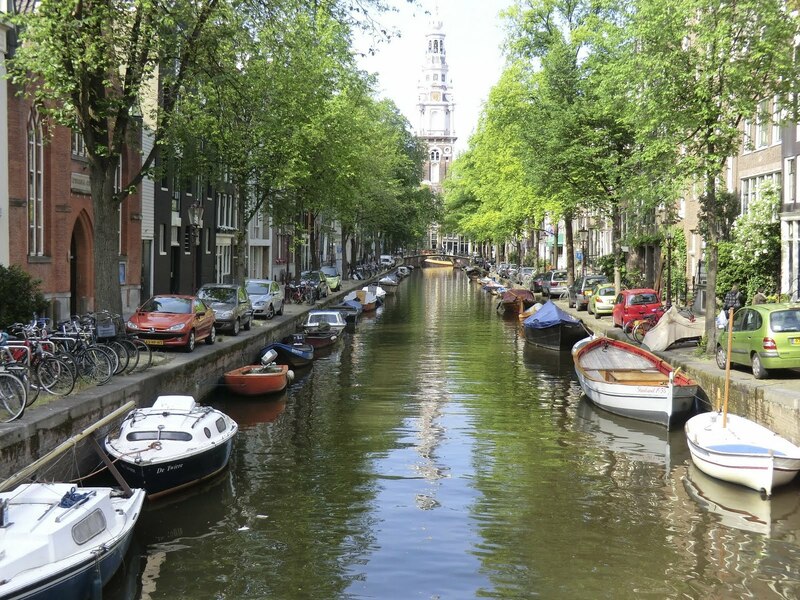 The canals in Amsterdam also provide a popular place for recreational activities, from boating to parades. Many of the city’s special events are held upon the waters of the canals. In the winter, locals ice skate on the frozen waters and then retire to the local eatery for a traditional cup of “snert” – pea soup. 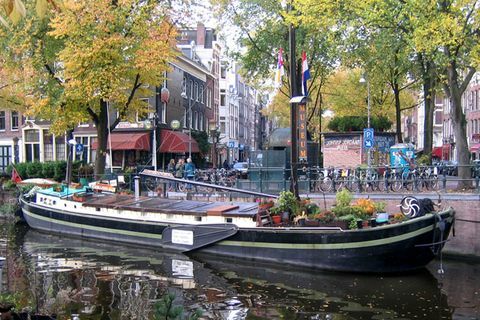 In December Amsterdam will celebrate by holding special events that take place on the Canals. The highlight being a floating parade on the Canals of some 40-50 extravagantly decorated and illuminated Boats. Where there’s water, there are Boats. Lots of different types and uses throughout the City of Amsterdam. 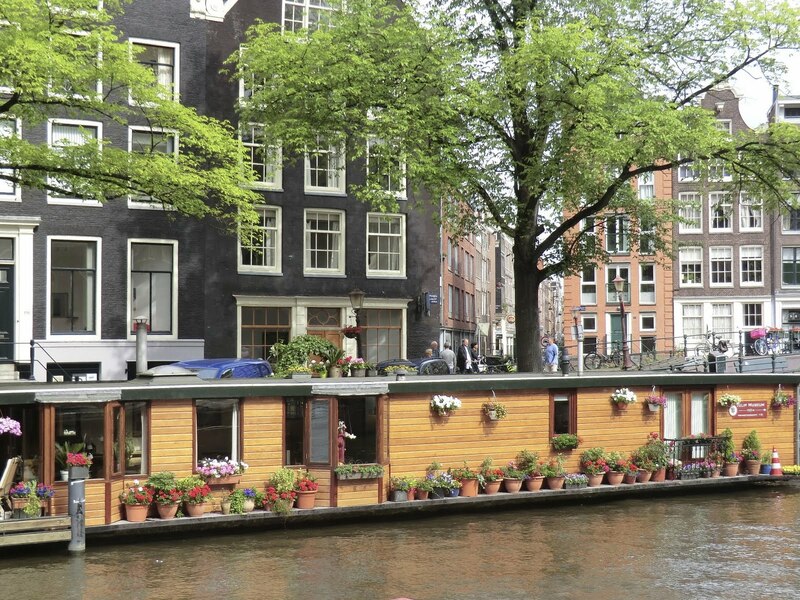 But the type that seems to really get the tourists attention are the Houseboats of Amsterdam. 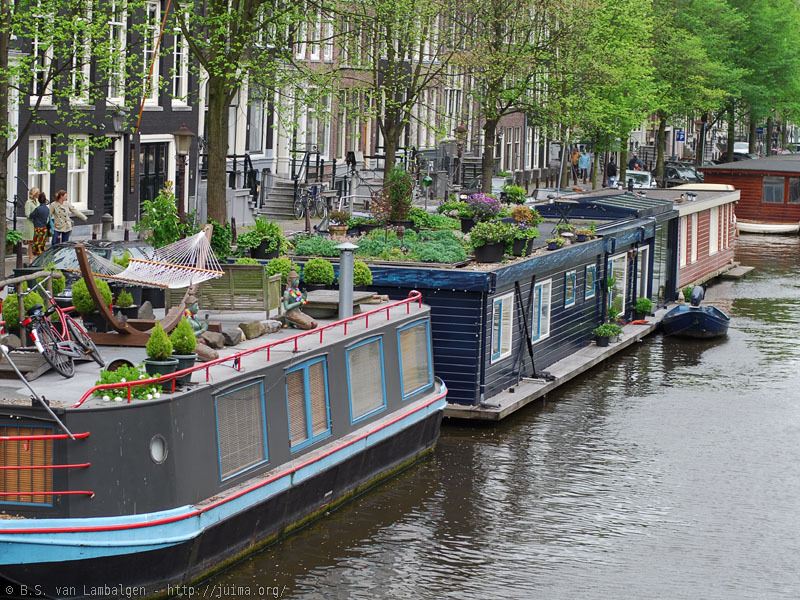 There are roughly 2500 Houseboats lining the Canals of Amsterdam, but it was only after WWII when there was a severe housing shortage, that they became popular. Though linked to the electricity and water supplies, they use the canals for sewage disposal. Gross I know, but the good news if there is any, is that the canals are actually flushed out 2-3 times per week. So, please people, no swimming in the canals. When I first learned this I was expecting them to smell, they do not. 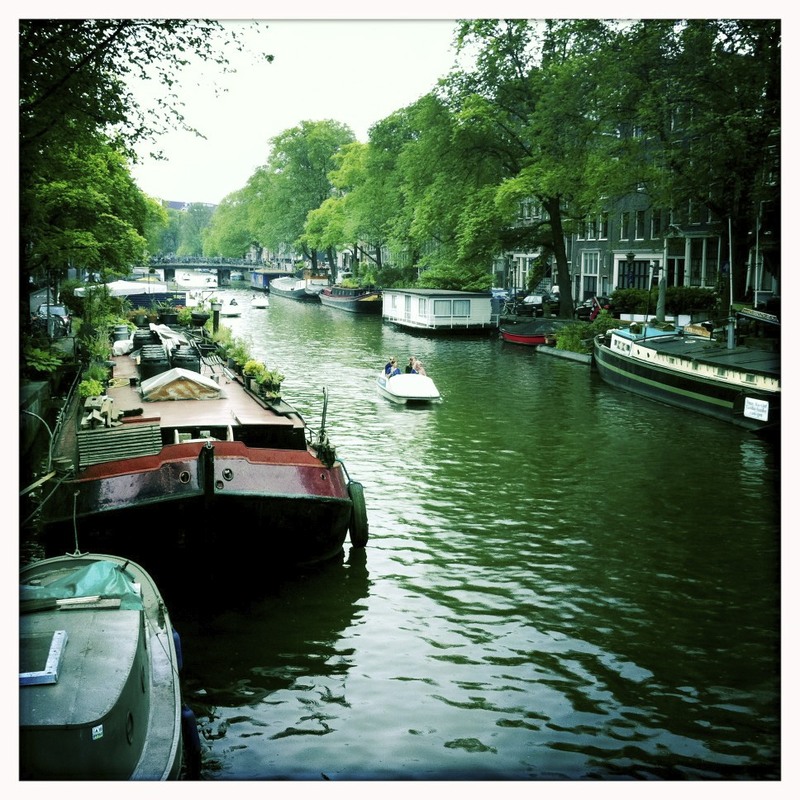 The canals serve as a home for those who choose to live on one of Amsterdam’s many houseboats. 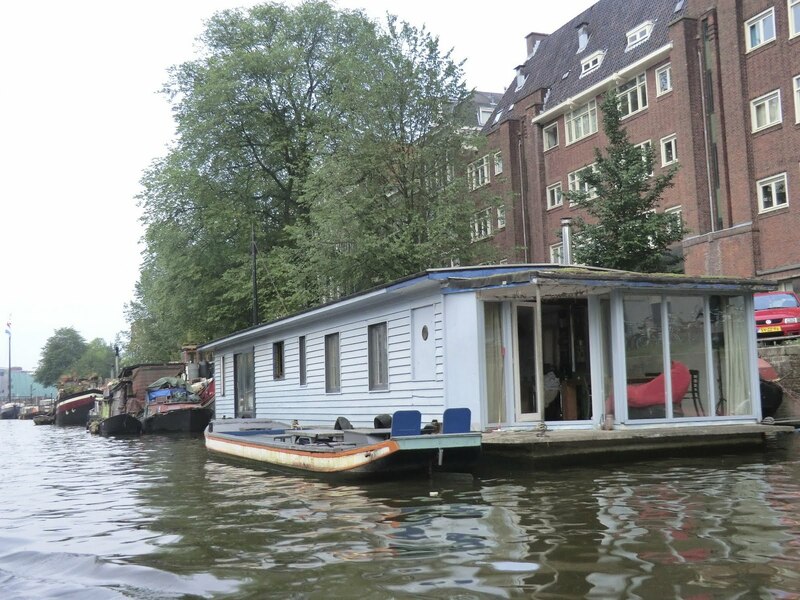 For a real Amsterdam experience think about renting a Houseboat for your vacation. A simply google search will present you with a number of options. 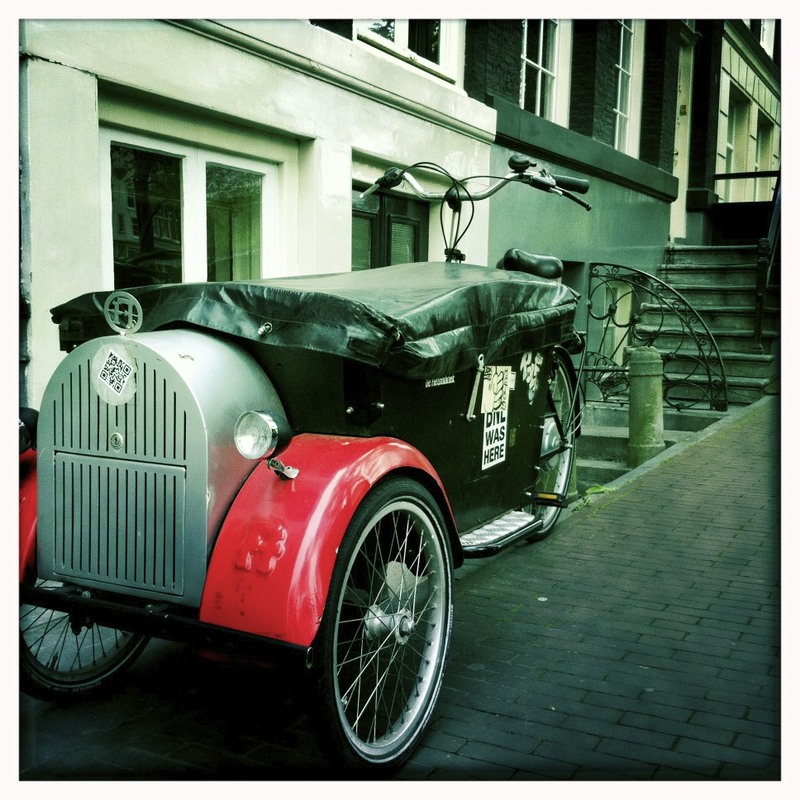 If you aren’t interested in renting one, but do want to know more about them visit the Woonbootmuseum in Amsterdam, visit it here. 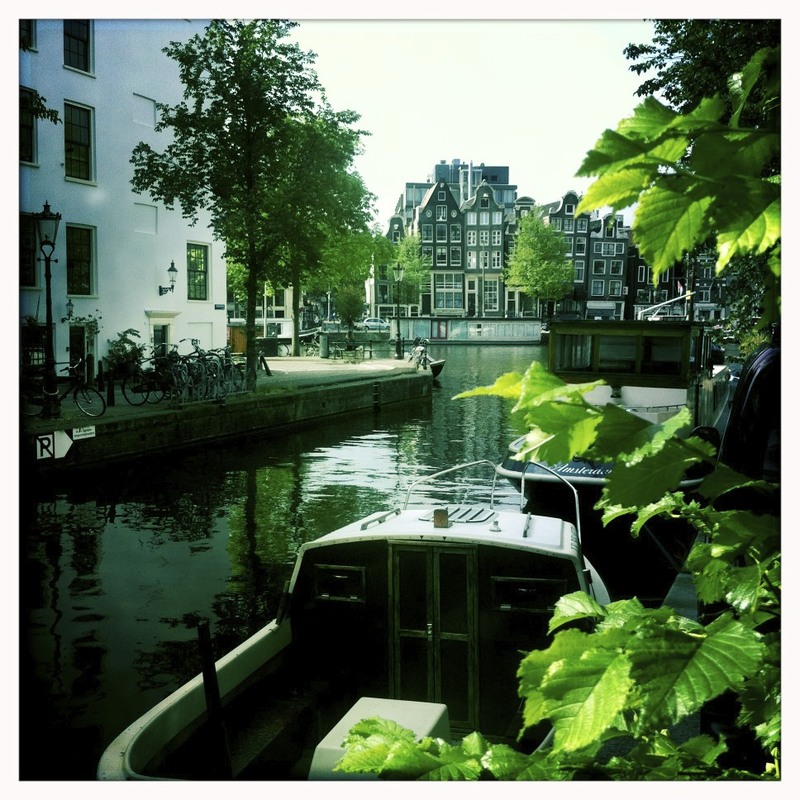 During our recent canal tour it was fun to see all types of people on houseboats, young people having a party, older folks enjoying their deck on the canals and those who have rented them to have the ultimate Amsterdam experience. It is important to note that if you have a houseboat and plan to sail into the canals and dock, that’s not going to happen. The owners of these Houseboats buy their location much like you and I buy a house or land, they pay for city services and taxes etc for that slip they own. Of all the Icon’s I could write about this one stays with me. 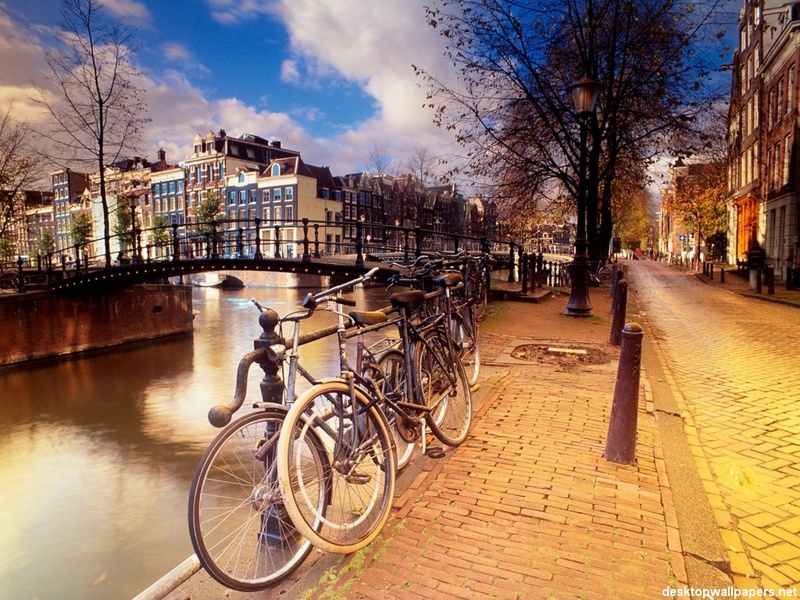 There are roughly 750,000 people who live in Amsterdam, yet there are more than 600,000 bicycles. Many of them have been locked up and forgotten along the Canals. Although many of the bikes are old, rusted and not even useable, they really add so much beauty to this city. 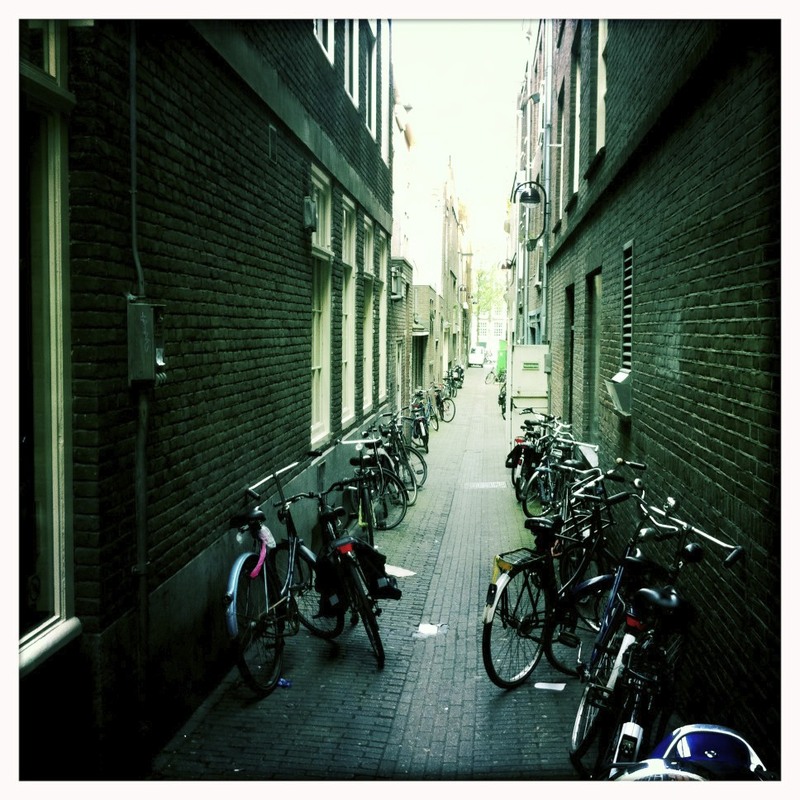 In Amsterdam, just about everyone bikes. It is not unusual to see mothers, grandmothers, business people, police officers, hippies, and so on happily bike along. Some people walk their dogs by bike. Others use it to bring home groceries, flowers, furniture, children, girlfriends or anything else one can think of. Young urban professionals tends to like purpose-built bikes – such as models designed to carry two or more children. Others prefer the classic cart-bikes, which can be used to transport large pieces of furniture or the contents of a small room. So-called ‘grandma’ or ‘grandfather’ bikes are sought after by those with a sense of history. The German army stole many of Holland’s bikes during World War II, and even to-date the Dutch will half-jokingly tell German tourists that they want their bikes back. 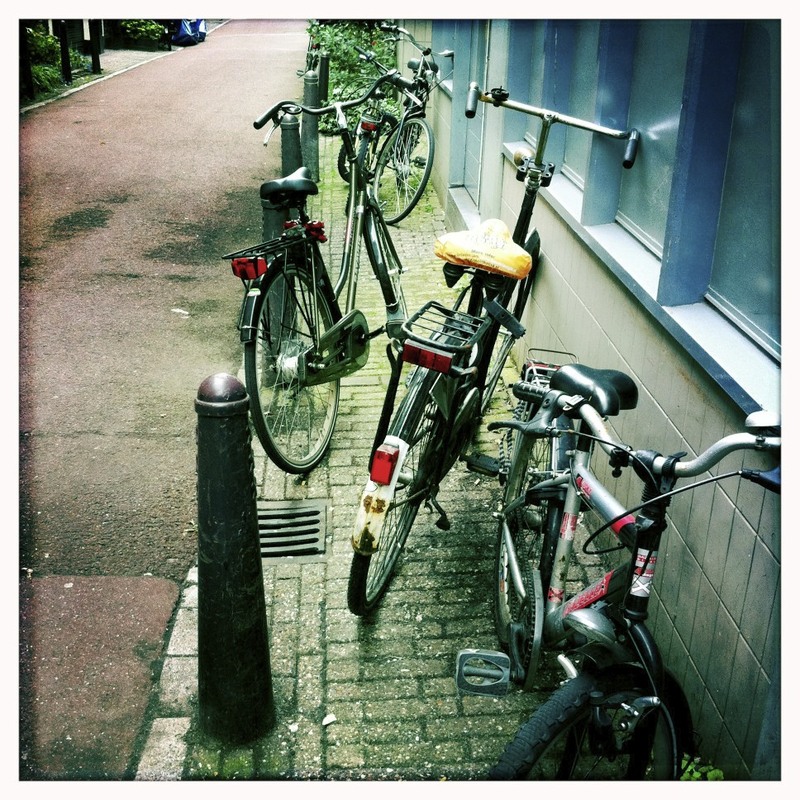 Bike theft is very rampant in Amsterdam. If someone approaches you on the street to sell you a cheap bike, most likely it is stolen. If the police were to catch you buying such a bike you will be fine nearly $250. Biking around Amsterdam is an excellent way to get around and see more sights than if you were only to walk or take a canal cruise. Look for Part 2 coming soon. That is on my list of To Do’s.